Biographer-in-Perth: Any advice for a biographer starting out on the journey you’ve just taken? Try to secure a publisher and agent up front. I succeeded in neither, but not without trying. I had twelve rejections from publishers, including two from the same company but under different managements, before I struck gold. Finally, it was someone whom I had contacted in the course of my research who was interested in Glaskin and who had read my manuscript who introduced me to his publisher, who then became mine also. Lesson: Never underestimate the value of friends, associates and others who can open doors for you. Sometimes, you just need to ask them. Such people have been pivotal in my having two books published. Try to secure funding up front or have some way of supporting yourself. Biographies can take years of work (this one took 13 off and on) and sometimes much travel (poor Nicholas Shakespeare went everywhere in the world that the peripatetic Chatwin did!). Again, I tried but didn’t succeed in getting any grants but I did have a partner who was a flight attendant so managed to get discounted air fares to cut costs, which helped a lot, especially with international travel. Spread out your research as widely as possible, mixing interviews with a broad cross-section of people who knew your subject in various capacities, with library research, online research, etc. Don’t discount anything you come across but also don’t feel obliged to use it all either. There are always other places (other books, articles, interviews, etc.) where some fascinating tidbit might come in handy. Once you’ve embarked on your literary biography, if you discover someone else is doing exactly the same, don’t be disenchanted. This happened to me and I nearly gave up on the whole enterprise. But others convinced me to stay with it. No two writers, even if they used the exact same material, will come up with the same biography. Get feedback on your work as it progresses to help you fine tune it as much as you can. I did this several times with different people before I had manuscript ready to send to a publisher, and even after I did. Some people I paid and some did it gratis. Try to have someone with some influence write a foreword, especially if you don’t have a very high profile. I was lucky in getting Robert Dessaix to play this role for me. My relationship with him was built over a number of years but once he read the manuscript and was excited about it, he was quite willing to do this, and more. Get interviewees to sign releases at the time of the interviews or soon after. It is often difficult to go back later and secure these, especially if the interviewee has died! Biographer-in-Perth: It’s been interesting and valuable for me to learn about John’s journey as a biographer. Thank you so much to John for sharing his thoughts. I know they will be of value to other biographers, as well as offering fascinating insights into a biographer’s work for readers of literary biography. Biographer-in-Perth: I felt I could perceive your struggle to know what to do with the anger and bitterness in Gerald Glaskin’s personality. Did you find it difficult trying to keep on the right side of all the people you’d interviewed, and their varying opinions of him? John Burbidge: I sometimes wonder if I gave undue emphasis to Glaskin’s more negative traits, but having talked with dozens of people and read hundreds of letters (his and others), I found it was something that came through very strongly and repeatedly, so I couldn’t ignore it. One early reader of the manuscript and a close friend of Glaskin’s thought I had overplayed this aspect of his personality, at the expense of his more endearing and positive qualities. I took this advice to heart and tried to ensure that I presented a fair and balanced appraisal of the man. (I later deleted an entire chapter because it was essentially just another example of his belligerent nature, so it seemed redundant.) 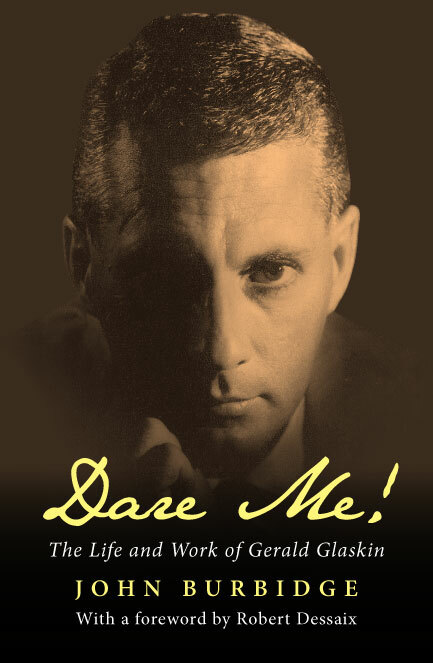 At the same time, I did not wish to downplay something that seemed to be a critical factor in answering a primary question of this biography, namely, what contributed to Glaskin’s poor reception as a writer in his home country? During interviews, naturally I tried to remain impartial and let people say what they wanted, regardless of whether it was pro or con Glaskin. I had no axe to grind or theory to prove, but was simply trying to paint the most honest and comprehensive portrait of the man and his work that I could. One way I attempted to do this was to reach out to a broad cross-section of people who knew him in various capacities and at different times in his life, then put together the pieces of the puzzle as they revealed themselves. Most people came across as honest and upfront, but I sensed a few held back from revealing aspects of Glaskin’s life they didn’t wish me to know about. I accepted that as one of the limitations of interviewing and trusted that further research would help fill in the blanks, which it usually did. When I came across the paradigm of ‘Glaskinitis’, I felt it was a breakthrough because it not only confirmed what I had perceived from many other sources but it put Glaskin’s more antagonistic traits in the wider context of a family behavioural pattern. Part 3 tomorrow: The Works and the Life.